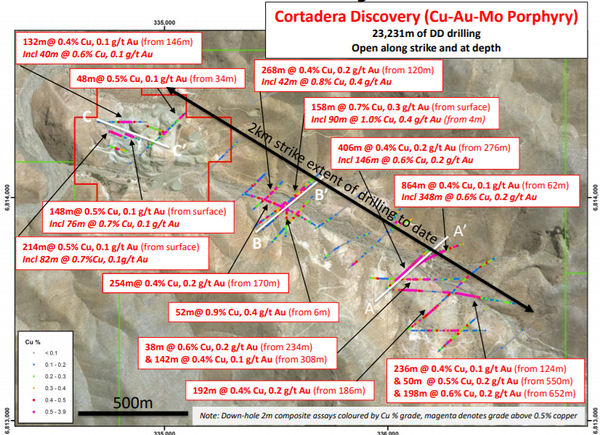 One of Australia’s leading and most advanced ASX-listed copper developers, Hot Chili Ltd (ASX:HCH) has started drilling at the Cortadera copper-gold porphyry discovery in Chile. This is a significant development for the company as the Cortadera discovery had not previously been publicly released, and included numerous significant drilling intersections from over 23,000 metres of diamond drilling. Cortadera lies 14 kilometres from Hot Chili’s large-scale Productora copper development along the Chilean coastal range. Impressive drill results included a 90 metre intersection grading 1% copper and 0.4 grams per tonne gold from 4 metres down-hole. Other near surface quality grade copper and gold intercepts were also identified. Encouragingly, historical deeper drilling yielded much broader intersections including 864 metres at 0.4% copper and 0.1 grams per tonne gold from 62 metres down-hole. While these results are promising in their own right, when examined in the context of Cortadera being part of a new large-scale coastal copper super-hub with a central processing facility, it is fair to say that it could be a game changer for Hot Chili. As a backdrop, Hot Chili negotiated a formal option agreement to acquire a 100% interest in the project in late February. The option agreement covered the vendor’s (SCM Carola) Vallenar landholdings (including the Cortadera discovery) adjoining Hot Chili’s Productora and El Fuego copper projects, located on the Chilean coastal range. The following map illustrates how strategically important Cortadera is for Hot Chili and its broader Productora Project. The potential of Cortadera hasn’t gone unnoticed, and Hot Chili announced on Thursday that it had appointed Australian advisory firm Sternship Advisors (Sternship) to act as corporate advisers for the group’s strategic funding process, following strong in-bound domestic and international interest in the Cortadera transaction. Sternship will manage a strategic partner process over the coming months to provide capital for the acquisition and funding of Cortadera, and ultimately the combined development of Cortadera and Productora. Results from the company’s current drilling programme and future funding initiatives are set to become key catalysts for Hot Chili over the coming months. Indeed, securing a strategic partner and any other initiatives that could assist in funding would be significant milestones for the group as they would represent an important step in terms of de-risking the project and paving the way for fast tracking development. Hot Chili’s exploration program comprising of 17 holes for approximately 5000 metres of Reverse Circulation (RC) drilling, commenced late last week and is advancing well. Five drill holes have already been completed and first samples have been sent for analysis. All five holes have recorded wide visual intersections of copper oxide and copper sulphide mineralisation from surface. Given historical drilling revealed extensive mineralisation near surface, it is likely that valuable information will be gleaned from the exploration program. Drilling across each of the three porphyries discovered to date will aim to confirm and extend areas of surface enrichment and wide, higher-grade, copper-gold sulphide mineralisation, which had not previously been closed off by diamond drilling. Results are expected to be released in the coming weeks following receipt of assays. 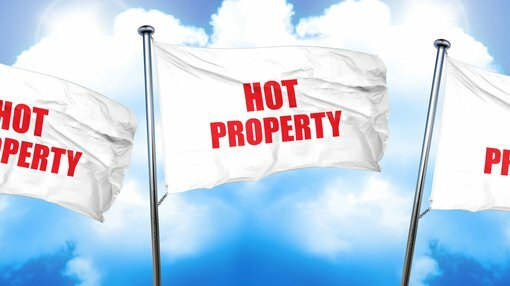 To fully appreciate the significance of upcoming developments, it is important to gain an understanding of Hot Chili’s achievements to date and its key assets. 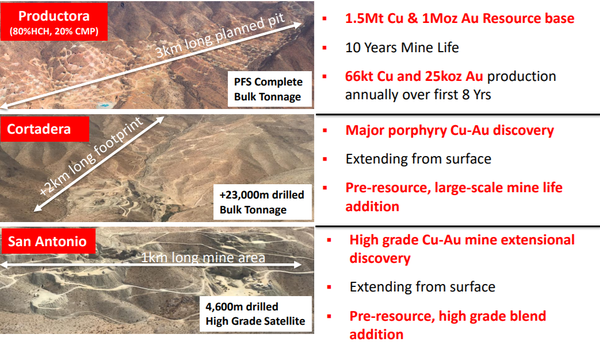 In a nutshell, the company is one of the top ASX listed copper developers with an advanced Chilean coastal range portfolio and a resource base of 1.5 million tonnes of copper and 1 million ounces of gold already established. An expanded growth strategy aims to transform the flagship Productora Project by increasing margins and lowering production costs through higher head grade and expanded metal output. To this end, Hot Chili has executed agreements to secure majority interest in three of the region’s highest grade and most substantial underground mines, all in close proximity to Productora. These mines which have been collectively named El Fuego were San Antonio, Valentina and Lulu. San Antonio which lies 20 kilometres east of Productora delivered outstanding drilling results in 2018, displaying a continuation of the main lode below the existing underground mine development, as well as high-grade near surface copper mineralisation. Importantly, mineralisation remains open at depth and along strike. Given there is evidence of higher grades at depth as indicated below, resource definition drilling at San Antonio will be an important milestone with the potential to provide share price momentum. Past records indicate that the San Antonio underground mine produced approximately 2 million tonnes grading 2% copper from shallow depths. The average copper grade indicated by recent extensional drilling and mining at San Antonio is approximately three to four times the average resource grade of Productora. In addition, gold and silver co-products at San Antonio could potentially provide valuable additional credits. Hot Chili went on to have further drilling success at the high grade Valentina copper mine, five kilometres north of San Antonio. Three shallow drill holes were completed across the southern extent of the Valentina copper mine with two of the holes recording significant drilling intersections, including 12 metres grading 1.5% copper from 28 metres down-hole, including 6 metres grading 2.7% copper. 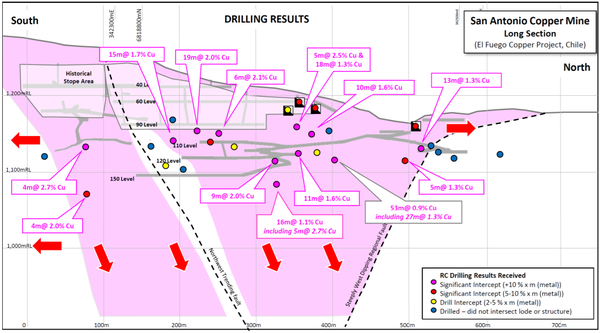 Another eight metre intersection delineated copper grading 2% from 124 metres down-hole, including 2 metres grading 4.8% copper. Importantly, the drill holes were located immediately south of the Valentina underground development and have successfully confirmed significant strike and depth extensional potential to high grade copper mineralisation. 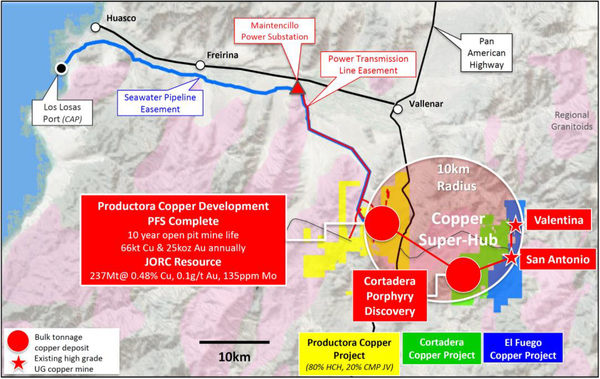 The Productora Copper Project currently stands as one of the largest copper developments controlled by an ASX-listed company. The 2016 prefeasibility study was based on a copper price of US$3.00 per pound and a gold price of US$1,250 per ounce, broadly in line with where copper is trading, while the gold price has been hovering in the vicinity of US$1300 per ounce for some time now. Based on these metrics, the PFS outlines a 10 year open pit mine life with the first eight years forecast to produce 66,000 tonnes of copper metal and 25,000 ounces of gold annually. This sees Productora sitting in a commanding position within the global development pipeline, where large-scale, low cost, long life projects in tier-one mining jurisdictions with very low capital intensities, are rare. El Fuego and Cortadera have the potential to host high-grade ore sources which can take advantage of Productora’s planned large-scale, low-cost processing facilities. However, even as the PFS currently stands, Hot Chili has impressive investment fundamentals. The following graph indicates that Productora alone has a net present value of US$219 million, applying a copper price of US$3.00 per pound. That is equivalent to $300 million in Australian dollar terms, suggesting the group’s market capitalisation of about $40 million is well shy of fair value. The company’s shares have rallied approximately 50% since late March, but with numerous catalysts on the horizon as indicated below, don’t be surprised if further upside eventuates. Also, keep an eye on the copper price, as even a nominal (8%) increase to say US$3.25 per pound results in a $140 million increase in the net present value of Productora. If investors start crunching similar numbers taking into account the group’s new assets there could be a substantial share price rerating.